For a limited time, buy 1 100% Whey Isolate Dissolvable Protein Scoops, 30 Servings & get 1 50% Off! DISSOLVES INSTANTLY: Throw the Entire Scoop in! Our instant dissolvable film is made of 100% Food Grade Ingredients so you can enjoy our great tasting smooth whey protein with ultra-convenience! I usually cannot stand anything vanilla flavored products, but this is the only one I could manage to drink. Even with water, the flavor is not to bad. The chocolate is a whole other level of delicious. These pods are insanely convenient as well. Been taking this product for while now, love it! Highly recommended! So I tried both the Chocolate and the Vanilla and surprisingly, they both taste really well and blend easily with water or milk. I personally prefer the chocolate over the vanilla. The vanilla mixed with milk, makes a frothy, cappuccino foam on top. Although the chocolate was better in my opinion, both are really good and clean options for protein. I can't say enough good things about Vade Nutrition protein pods. I would always have to portion out protein powder when traveling and it would always explode or bust in my bag causing a huge mess. This product is brilliant! I use it every day after working out or just for a sweet treat before bed. I will mix almond milk, chocolate syrup, avocado oil, and a vanilla Vade protein pod to make a "bullet" chocolate shake and it is so good, full of protein and good fats and it is amazing. I am so glad I saw Vade on Shark Tank and am so glad they are changing the protein powder world!! Saw this product on shark tank and had to try it out. This protein tastes so good and doesn't have a weird after taste like some proteins do. The chocolate and vanilla flavors taste just like a chocolate or vanilla ice cream shake. The dissolvable pods dissolve immediately once you put water in your shaker and shake it up. The pods are also super easy to transport. Love it! So much to say when it comes to your protein shake. I use these for anything. I recently post one on my page for coffee (I use chocolate for coffee) . I use vanilla to sprinkle all over my eggs. When you're in this I industry you'll do what it takes to find that taste you like! Thank you Vadenutrition for creating such a unique style of protein. Best one in the market so far! I love VADE protein scoops because it's so convenient for someone with a busy lifestyle. Also, there's never any clumps in my shake which usually ruins protein shakes for me. It's so yummy and my favorite flavor is chocolate with almond milk! I really wanted to try these pods out because they looked so cool and portable. Then I tasted them and fell in love. These are now staples in my morning shakes and my mid-afternoon shake as well. My wife loves these and my kids are amazed every time I turn the pod into protein with my "magic" haha. Highly recommend these not only for muscle building but for anybody who is on the go constantly and can't always lug a huge tub of protein around. This company rocks. This is my second batch and I couldn't be any happier! I originally found out about VADE through watching Shark Tank on my boyfriends couch, it honestly spoke to me! Within seconds I reached out for my phone and started looking into it. When I got my hands on my first batch I loved the taste! It did not taste like any ordinary protein powder, I was shocked on how amazing it tastes with water. Each pod is mess free, consists of 20g of protein and is only 90 calories. Within three weeks, my gym buddies noticed that I was more defined and asked about the protein I was using. I told them VADE. I highly recommend it! 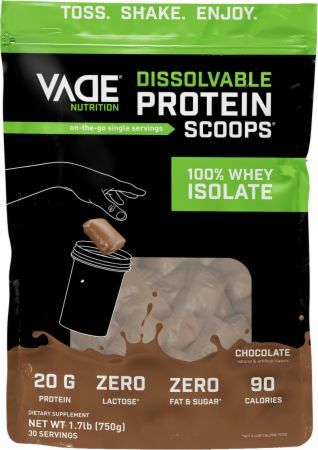 Directions For 100% Whey Isolate Dissolvable Protein Scoops: Add one 100% Whey Isolate Dissolvable Protein Scoop® to 6-10 oz of cold water, milk, smoothie or favorite drink. Shake or blend for about 10-20 seconds or until smooth. For best results do not mix more than 1-2 Dissolvable Protein Scoops® in liquid at one time. Do not remove the pre-measured protein scoop from its clear dissovable film. Warnings: Consult your healthcare providor to use if you are pregnant, nursing, taking any medication or have any medical conditions. THIS PRODUCT IS INTENDED TO BE CONSUMED AS A BEVERAGE AFTER BEING DISSOLVED IN LIQUID. DO NOT EAT, INGEST, OR SWALLOW WHOLE, FOR RISK OF CHOKING.